Sweet Romance Reads: Is It Too Soon For A Beach Read? And A Giveaway! US mainland winners will receive an autographed print copy of the book they choose. International or overseas winners will have the book mailed directly to them from Amazon. I’ll announce the winners on Feb. 28. 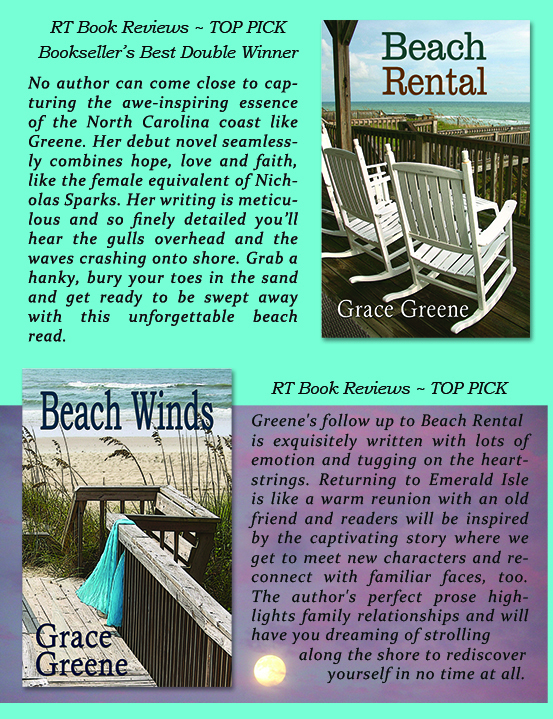 BEACH RENTAL and BEACH WINDS (the sequel) are set in Emerald Isle, NC ~ one of my most favorite beaches. Unlike most east coast beaches, it lies east-west and you can walk toward the sunrise in the morning and the sunset in the evening. Both books were awarded TOP PICK ratings by RT Book Reviews. They are suitable for all audiences. The two winners will be drawn from among those who comment on the Events page at www.gracegreene.com (direct link above) and you are welcome to sign up for my newsletter while you’re visiting. Also, while you’re here at the SRR blog page, I hope you’ll sign up for the SweetRomanceReads newsletter. You’ll see the signup box on the right-hand side of this page. And check out our Pinterest page. Grace Greene is an award-winning and USA Today bestselling author of women’s fiction and contemporary sweet romance set in the rolling hills and forests of her native Virginia (Kincaid’s Hope, Cub Creek) and the breezy beaches of Emerald Isle, North Carolina (Beach Rental, Beach Winds). 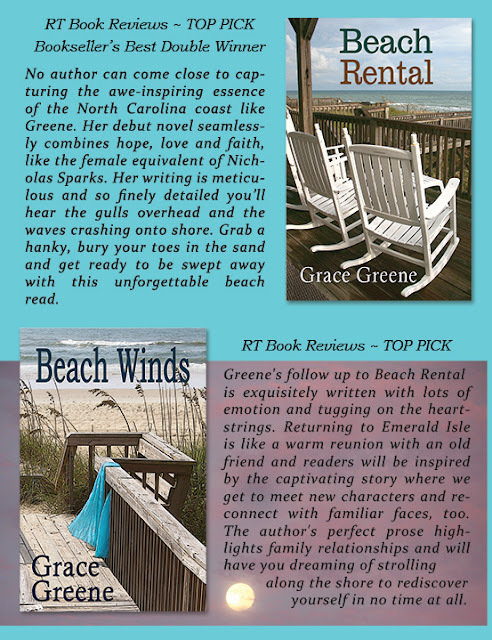 Her debut novel, Beach Rental, and the sequel, Beach Winds, were both Top Picks by RT Book Reviews magazine. She is the author of The Happiness in Between (release date: January 31, 2017), a standalone also set in Cub Creek. Her next release, The Memory of Butterflies, is due out September 5th. For more about the author and her books, visit www.gracegreene.com or connect with her on Twitter at @Grace_Greene and on Facebook at www.facebook.com/GraceGreeneBooks. Spring is definitely in the air in SC, too, Grace. Best wishes, on your new book, The Happiness in Between, also. Thanks, Josie! It's such a gorgeous day here. I need to go outside and take a proper walk. I hope you'll get to enjoy a lovely Sunday afternoon, too. Spring is in the air here in Texas, too. I'm so excited! Of course, we had a crazy mild winter so I have a feeling summer may be a bit brutal. It's possible. I imagine the weather in Texas can be even more extreme than what we experience here in Virginia. I agree, Merrillee. Beach reads are good year-round!